Product #45859 | SKU S-62FOGAB-GB | 0.0 (no ratings yet) Thanks for your rating! 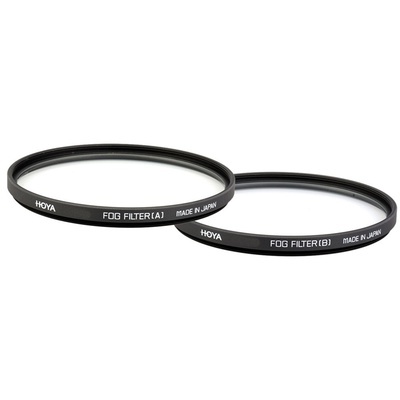 The Hoya 62mm Fog Filter Set includes a Hoya 62mm Fog A Filter and a Hoya 62mm Fog B Filter. Both feature a semi-opaque substrate that allows them to create the appearance of fog in an entire image. Unlike a soft-focus filter, their effect is not limited to affecting how light entering a camera is refracted. Instead, image details are deliberately obscured in a manner that is similar to how natural fog prevents an observer from clearly discerning objects or elements within a scene, while light sources become substantially diffused. The effect of the Fog B filter is approximately twice as strong as that of the Fog A filter. These filters are non-coated, constructed from optical glass, and each feature an aluminium-alloy filter ring that is durable while remaining lightweight. Box Dimensions (LxWxH) 4.3 x 4.2 x 1.5"